Croatia is one of the most picturesque places in the Mediterranean. Its landscape has been described as " one of the most stunning coastline in Europe...with its mix of limpid bays, craggy bluffs, hidden coves and beaches, vineyards and forests …"
At Dubrovnik, the stunning natural beauty is combined with the ancient rock walls of the the historic Old Town. 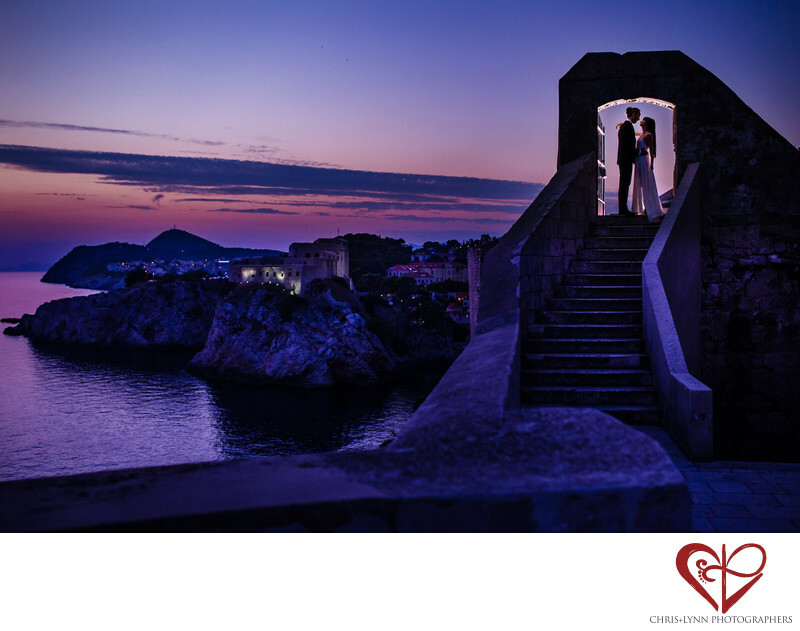 Add a romantic sunset, and you have an incredible setting for a wedding portrait. This couple gave us two things we love as photographers, creative freedom and time. For their bride and groom portrait session, done after the actual wedding day, we spent several hours exploring the city, talking about life, and walking along the wall. With no time constraints or guests waiting, they were able to relax, be themselves, and have fun. They also wanted to create some images with us that really showcased this very special and distinctive location. We thought this doorway would be an ideal spot for a silhouette image of the couple that incorporated the coastline and ocean. To separate the couple slightly from the quickly darkening sky, we added an off camera flash to give them a rim light and exposed for the sky to keep the color vibrant. When we arrived at this staircase, the sun had actually already set and the wall was officially closed, but the family who lived at this spot and were in charge of locking the gate kindly kept it open for us. They also blessed the couple, gave them each a drink, and found a bandaid for the groom who had a blister on his foot from so much walking! It was wonderful to create this memory while creating this image. View this couple's Slovenia destination wedding at Dvorec Zemono in the Featured Wedding section of our website here. 1/800; f/2.0; ISO 800; 35.0 mm.